Roof leaking? Missing shingles? No problem, we have over 25 years of experience with leak tracking and repair. Maintaining your roof should be the top priority for any home or business owner. Our pricing is cheaper than having a tarp installed and we are available anytime, 24 hours a day, 7 days a week. We will be onsite fast to determine why your roof is leaking, how to fix it and prevent it from happening again. While we are onsite, we will locate where the leak is coming in your property, track the leak in the crawl space when applicable, examine the area on the roofing system to find the problem and then provide a permanent or short term fix when necessary. Composite shingles, metal roofs, single ply roofs and flat roofs of any kind. We’re There for You in Any Roofing or Storm Damage Emergency! Because we understand that leaks, storm damage or other emergency situations can arise at any time of the day or night, our repair team offers 24-hr services with a quick two to three-hour response time. 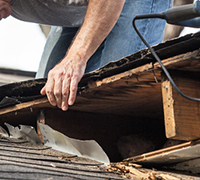 Many roofing companies will tarp the area where a leak is occurring and return at a later time to complete the repair, but our repair team will fix any leaks that we find on the spot so that you can get back to your day. While many homeowners and commercial property owners don't think about their roofs until an issue arises, preventative maintenance for your roof can help you avoid costly repairs or replacement further down the line. Regular maintenance is both cost-effective and quick, but the potential savings in money, time and headache can be significant. At Grant Roofing & Pressure Washing, our experienced roofing technicians are pleased to perform routine roof maintenance for a wide range of residential and commercial clients throughout the Portland and Vancouver areas. Depending on your roof and building type, our team of technicians will perform a variety of services as part of your preventative maintenance. For residential owners with traditional shingled roofs, we can check for missing or damaged shingles. Buildings with a metal roof will be examined for signs of rust. Any areas around chimneys or joints that have cracked caulking or mortar will receive new sealing. As moss is common throughout the Pacific Northwest and can be extremely damaging to roofs of all types, our roofing experts check for moss growth on all of our maintenance calls. For the convenience of our customers, Grant Roofing & Pressure Washing offers semi-annual contracts and annual contracts for our maintenance services so that you can be certain that your roof is always in good hands. Storm Damage – High winds and fallen trees can cause severe roof damage! If you are experiencing a leak after a storm, contact us immediately to prevent further damage to your property. We also provide tree removal for fallen trees that are in danger of causing further damage. 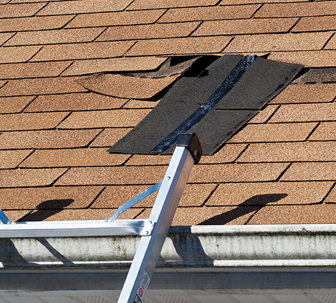 Missing Shingles – This can cause the shingles around the missing shingle to blow off and result in water intrusion and water damage. Weathered Shingles – If they are splitting, curling, or if all the granules are gone, they are more than likely to blow off and they have lost their waterproofing. 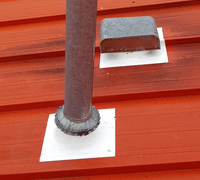 Rusted Flashings – This could be on your pipe boots/jacks, skylights, or around your chimney. This is an early sign of failing flashing that could result in future leaks. Dark Areas on Your Sheet Rock – this is an immediate sign of water! Something is leaking where it should not be and needs to be looked at right away. No problem, we can replace missing shingles to make sure your roof does not leak! Whether you have 3-tab, architectural or presidential shingles - we can fix any wind damage on your roof. It’s extremely important to have your commercial roof surveyed at least once a year. We have over 20 years of experience surveying all types of commercial roofing systems. We will review everything on the system including roofing type, penetration points, walls, flashings, gutters and debris build up. We will then provide you with a fully detailed PDF report that includes pictures and recommendations. We will point out any issues that need attention including gutter cleaning, debris removal, sealant work needed, flashing attention and more. Suffering from a roof leak or need general maintenance? Contact us anytime! We’re available 24 hours and can be at your property within 2-3 hours. swap_horiz Slide to view the transformation!